These are great for school lunches and a quick snack. They keep well. 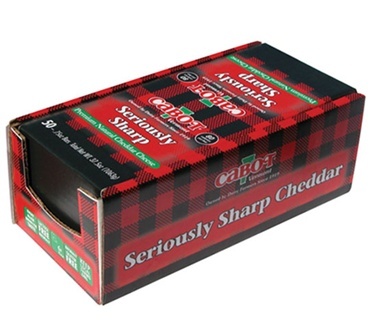 I have always love this cheddar and this is perfect for snacks at work, school or on the road.I will continue to purchase for both work and home as everyone loves it!! I would and have bought this product again and again!! This is one of the best 'snack' products that Dakin farms offers. I use to get this inthe store inthe smaller packs but I haven't been able to find them anymore. But this is just as good and makes it convenient.The only other thing I would wish they would bring back is the Jalepeno Cheddar snack size. I think a lot of people would like that too. I grew up in Vermont and Cabot cheese was absolutely delicious. Now that I am retired from the Army and living in Texas, it is great that I am able to get the flavor of Real Cabot cheddar in TX. The snack size is great for me so that the individual packets are independently sealed and always fresh. I have bought the snack size previously and will definitely order again. I love the flavor of the cheese and the convenience of the packaging. Great for school lunches & travel. Excellent flavor.